Forget Google when you want good cheese—she will only mislead you when you get directions to Marin French Cheese Company. Using the directions on the website, find this lone establishment in the rolling greenery of Marin County. Established in 1865, this place has some serious history. It’s still going strong though, even though it’s surely out in the middle of nowhere-ville, USA. 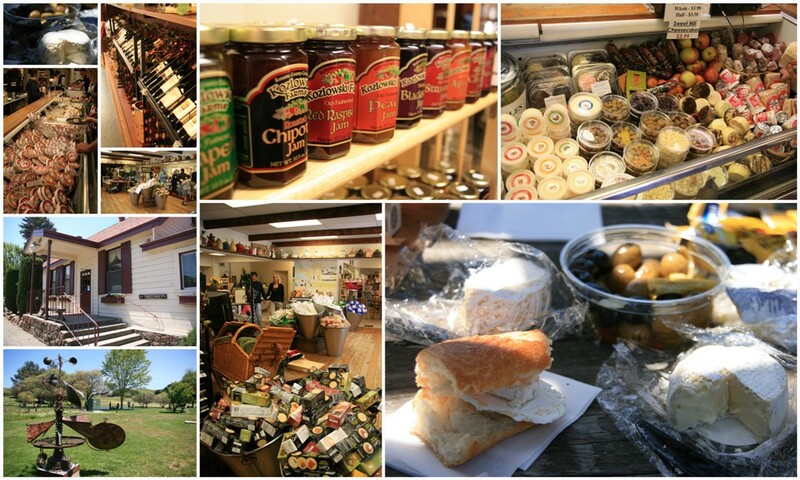 The drive over is beautiful, the grounds are welcoming and have picnic areas around a small lake, and let’s not forget the cheese, which is delish! If you show up at the right time, you can even see a tour of their cheese making facilities or have a look around their art gallery. A great stop if you’re having a lazy weekend in the country. Cheese, wine, and the great outdoors at Marin French Cheese. Highway 1 is dotted with small shanty restaurants all up the Marin Coast (and probably the entire west coast), and Nick’s Cove is one of these seemingly run-down landmarks. On the outside Nick’s looks like a standard wood framed, one story shack that may have come straight from the early 1900’s, but the inside is something quite different. While certainly not uber-fancy, it’s a step above what you might expect from a wind-blown fishing area. The valet parking is mandatory and complimentary, so don’t freak out and drive right by like we did. Just let the friendly gentleman take your car away; Cal Trans has required Nick’s to do this, probably to keep customers from having to walk across the highway. Fresh seafood and delicious salads at quirky yet tasteful Nick’s Cove. 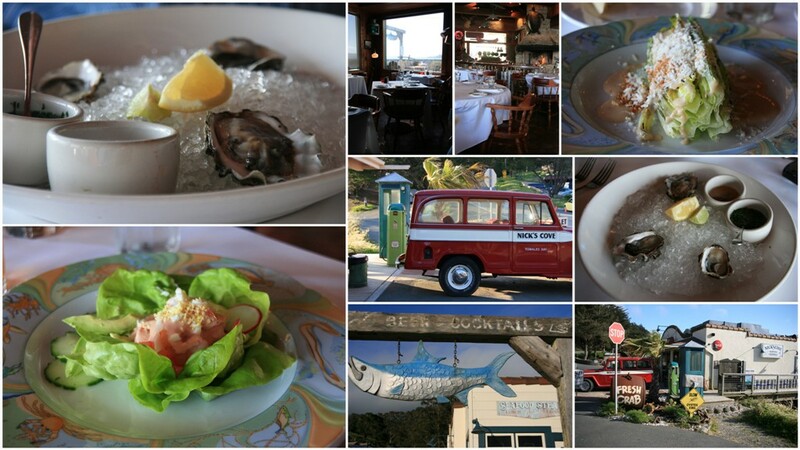 Situated right on Tomales Bay, Nick’s offers gorgeous views along with it’s upscale, albeit somewhat limited, menu. We were there for dinner and were offered a variety of oysters, about a dozen starters including salads, soups, and shellfish, and a handful of main dishes. The mains were mostly surf and turf and you can tell by the wording that it’s not cheap. That said, it’s not outrageous either and, judging from what we had, it’s worth the money. We only had appetizers and drinks but everything was really top notch in quality and taste. The shrimp Louis was fresh and perfect, the grilled hearts of romaine were like a Caesar salad with a twang and were excellent, and the oysters were…oysters. If you like oysters, I’m sure these were top notch, and they came with sauces that can make them tolerable even to the rest of us. The waiters knew everything about the menu by heart and without hesitation and the bustling staff refilled waters and sodas and removed empty plates with lightning speed. 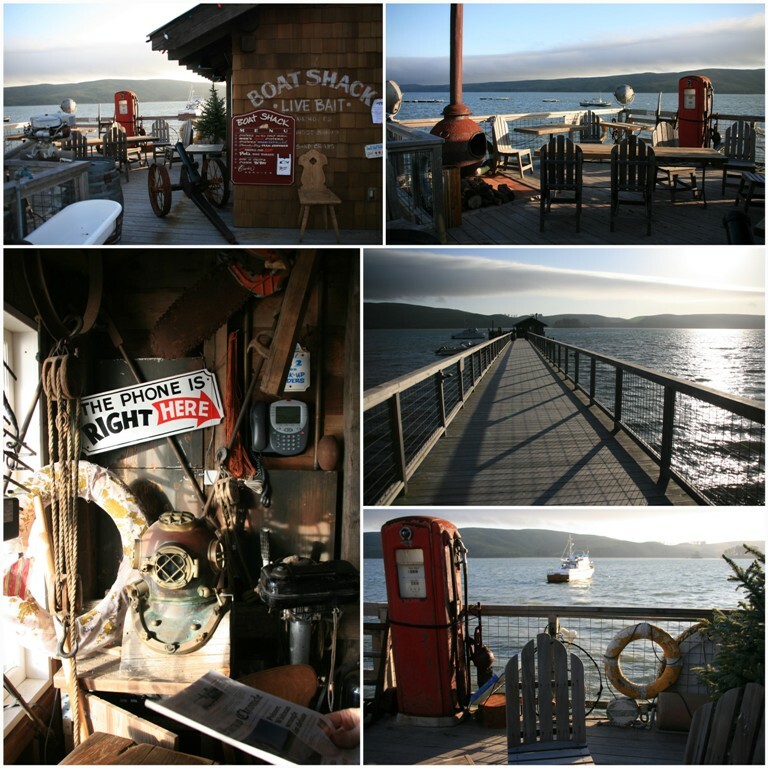 Along with masses of old gas pumps, anchors, and other fishing equipment scattered around the place in a way that gives it character rather than lawsuits, they also have a dock behind the restaurant that goes out onto the bay and ends at a small shack. This shack has a couple tables and a few chairs and accommodates probably no more than 10 people. But if you make it to the shack in time to grab a seat, you can order from the restaurant via a provided phone and they’ll bring you food while you enjoy the rustic nautical decorations (or stored items?) and scenery from your own private cottage. On warmer nights (if that happens in Marin), there is outdoor seating on the dock as well with a large fireplace. What fun! The dock at Nick’s Cove with the surprise cottage at the end. Since we stayed at the Point Reyes Seashore Lodge on this trip, we also decided to patronize their restaurant—The Farm House—for our Mother’s Day lunch. The website listed a Mother’s Day menu that looked good, but we were very surprised to find that that menu was just the specials list, offered in addition to their standard lunch menu which is huge! 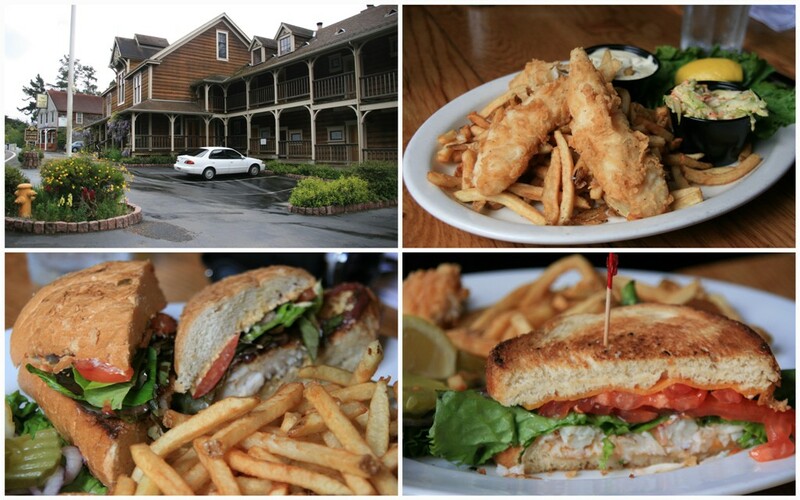 The selection of food here is immense—almost too large—and includes a large variety of oysters, starters, soups and salads, and entrees, which are again mostly surf and turf but often in sandwich form for the lunch menu. The specials list was almost white noise against all the other food on the menu; none of us ordered from it that day. The food we ordered took a while to arrive, but was really delicious. At our table were two grilled crab and cheese sandwiches (slight modification from the menu to include melted cheese), fish and chips, and a blackened rockfish sandwich. Everything came with hand cut fries, or you can substitute their delicious and sweet onion strings. Mom also received a complimentary glass of sparkling wine just for being a (good*) mom. Overall, the food was satisfying and tasty and was pretty reasonably priced for a nice Mother’s Day lunch. I think the Farm House is doing good business and makes a great addition to what the Seashore Lodge offers to patrons. The front of the Point Reyes Seashore Lodge and adjacent Farm House Restaurant (at the far end), along with three of our delicious Mother’s Day dishes. Overall, we had a great and tasty weekend, and were even graced with mostly beautiful weather. It rained a bit on Sunday morning, but it didn’t hinder our beach walk or our trip out to the Point Reyes Lighthouse. Happy Mother’s Day everyone! *They did not verify that she was a good mom, but she is, so I’ll say that’s why she got it.